I make one pun and you ottermatically have to make one of your own. Holt with your wordplay, sir. I have to make puns, otterwise I'd go nuts. What about the otter guys? They might vote us off the island for otterocities. They can contribute otterwise they can move on. I car not for the opinions of otters. Enough already. I ran all your lame puns through a laugh-o-meter to see if they passed the funny test. No pun in ten did. The little guy is right downtown in Chinatown eating Koi. How did he get there? How did he make the discovery of all the free fish? Inquiring minds want to know. 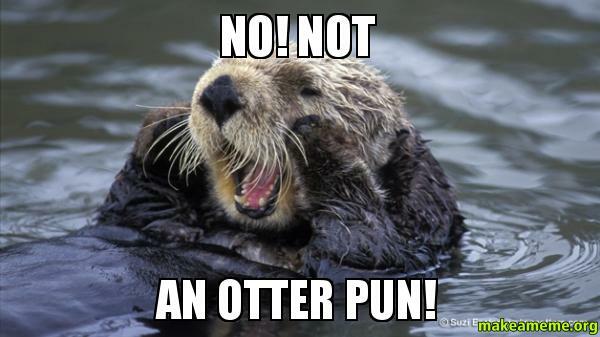 I otter do better with my next set of puns. So you were punitration testing? I have no further puns at this time.